Our NCIS review broke down "Squall," this week's episode, in detail. Now, TV Fanatic staff members Steve Marsi, Douglas Wolfe and Christine Orlando have assembled for our weekly Round Table Q&A discussion of various events and topics from this installment. Join in as we analyze another entertaining hour of TV's #1 show! 2. What was your favorite scene from "Squall?" 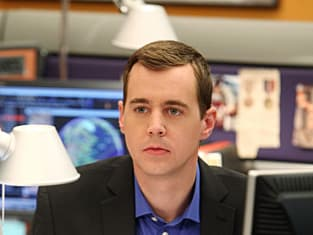 Doug: Jamey Sheridan did such a great job in making Admiral McGee an objectionable jerk whose son could do nothing right that I enjoyed watching Gibbs getting all paternal and taking him down a peg or two. There was a visceral satisfaction with that. Christine: I liked that Tony took the time to talk to Tim about his daddy issues and pointed out that he's not alone. That Tony and Ziva have had to deal with difficult father's too. The scene was a good reminder that no matter how much ribbing Tony dishes out to McGee, he still cares very much for him. Steve: Had to be Gibbs laughing at McGee's plans. How many times have we seen that? Just one of many terrific Gibbs-McGee moments, as Doug touched upon, in what was a great episode for both. 3. What was your favorite quote (or Tony one-liner)? Doug: Tony: "Well you’ve got a long list of juvie priors, a history of possessions and frankly a blood workout that makes Sid Vicious look clean." Wyath: "Sid who?" I laughed out loud at that one. Christine: Tony's "There's no way that shaky the clown could have stabbed the Commander with that kind of precision." Steve: Because I went with Gibbs in my previous answer, I'll take Tony on the basketball court, deploying his usual wit while also stepping in and taking command of the situation. 4. Biggest problem with the episode, if any? Doug: Once again I had to laugh when Tony and Burley told Wyath to stop, and we saw Wyath’s wheels turning. He was going to make a run for it. But, to where, exactly? The ship was on lockdown. Did the writers intend to make him look that stupid? If so, they did a good job. Christine: I agree with Doug. When Wyeth took off I kept thinking, "Where is he going? He's on a ship." Steve: Only that the Admiral would think he could conceal Stage 4 cancer, or that his aide would resort to such drastic measures to meet his own agenda. The episode was very well-written overall, and I know it's TV, but how could either envision that they could get away with it? 5. How much do you love Tim? Doug: I’ve got a lot of bro-love for the guy. He’s decent through and through and, despite his father’s reservations, the guy is a man, fully able to stand up for himself and read the riot act when required. Christine: I always love McGee but I wanted to slap him when he talked about bailing on his "Little Brother." He'd gotten so wrapped up in his own issues that he couldn't see how devastating that type of abandonment could be to that kid. Steve: Always have, but even more so after this week. Good guy, McGee. 6. Tony-Ziva jealousy: Entertaining or overplayed? Doug: Still entertaining, I think. They need to ramp it up though: these minor teasers can get irritating if they go on too long. Christine: I'm honestly kind of annoyed by it because it seems to go no where. They've teased this relationship for far too long. Either give us a Tony/Ziva payoff or let it go. Steve: I go back and forth on this often. I understand that it's become a central facet of the show to keep us guessing, and to keep that tension going. That's fine, but when specific instances start to repeat themselves - as Tony even acknowledged with Stan the Man - it can start to feel a little stale. 7. It's been teased that The Admiral may play a role in the stretch run of NCIS Season 10. Do you want to see him again? How might he tie in? Doug: Actually yes. Despite his horrible character I’d like to see him again. I’m not convinced he’s completely changed into the guy who should have had his son’s back all these years, and didn’t. He might prove to be the one guy who takes Bodnar down, at the cost of his own life, perhaps in defense of his son. He’s dying anyway so he might see it as a way to make up for old wrongs. Christine: I wouldn't mind. I like that he brings out a more serious side to Tim and a viscerally paternal side of Gibbs. Steve: They certainly left you wondering, didn't they? His walk with Tim at the end signified that part of him, deep down, wants to make it right, even if he doesn't know how. Despite his Stage 4 cancer, I get the sense there is still time for him to find redemption with both his son and the Navy. 8. Which NCIS team member would you want as your Big Brother or Sister? Christine: I'm a movie buff so I've got to go with Tony. Steve: While a strong argument could be made for any of them, I'll go with Abby or Jimmy. Both are eccentric and different people, yet also warm and successful. They'd relate well and lead by example.